Retirement and 401k accounts tend to be a bigger issue when older adults get divorced, particularly those over the age of 50. But these issues can affect couples of any age, so it’s important that Dallas couples understand how they factor into a divorce case. The net worth of some retirement and 401k plans can be significant. Because of tax implications and other issues, dividing these assets can be quite complicated. It’s important to have help from an attorney who’s not only familiar with divorce cases in general but has a good understanding of how to handle these accounts when dividing assets. The assets from these accounts are usually considered marital property if they were acquired during the marriage, especially since both spouses anticipated benefiting from these monies later. However, sometimes this isn’t the case. This might be true if one of the spouses already had a 401k plan set up prior to marriage. But if the value of that plan increases during the marriage, then it may be marital property. There could be not only federal guidelines but also state laws when it comes to the division of these funds which can complicate matters. Couples must adhere to these rules and take them into consideration when determining the split of these funds. The court will enforce a Qualified Domestic Relations Order (QDRO) if the divorce agreement requires dividing any pension plans or 401k accounts. This order sets up the payment of monies to the spouse who wasn’t the employee of the 401k or retirement plan. The monies withdrawn aren’t penalized. They are put into that individual’s retirement account. It allows you to continue to contribute to the account and your spouse can choose what to do with his or her portion of the monies. The QDRO must be set up before the divorce is finalized. There are many different options to consider when it comes to pension plans. For instance, the spouse with the 401k or retirement plan may buy out the other spouse’s share of the account. In other cases, the monies are evenly split down the middle. Or the spouse may keep all assets from the pension plan and allow the other one to take other marital assets with comparable value. Then again, if both persons have their own pension plans they may not want to bother dividing the funds. It’s important to consider ahead of time any future financial needs and how to meet them. Working with an attorney and financial advisor can ensure the QDRO is set up correctly. As Dallas couples work to divide your assets and consider the various options available, each may require legal assistance to protect their rights. 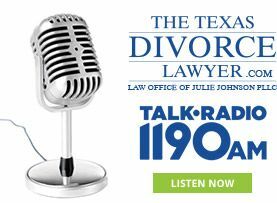 Julie Johnson helps individuals who are going through a divorce and facing disputes regarding asset distribution or who simply need assistance protecting their rights when dividing large assets. Call 214-265-7630 to set up a consultation today.